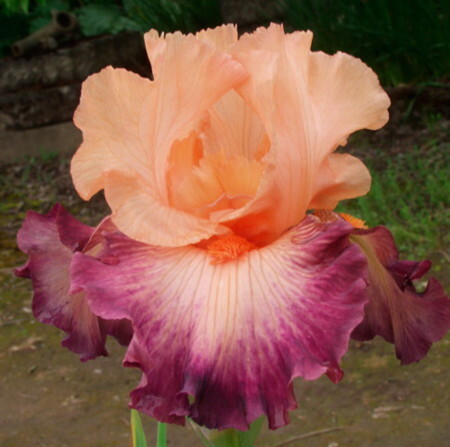 'Wisecrack' ( Keith Keppel, R. 2012) Seedling #05-85A. BB, 27" (69 cm). Midseason bloom. Standards burnous (M&P 9-C-4) to orient pink (9-A-6); style arms jonquil (9-J-5); falls capucine buff (9-E-4/5) shoulder paling and blending with violet (43-C-8), plumbago grey (44-B-4) at edge; beards solid fire red (1-F-12), prominent. Seedling #01-61B, 'Brazilian Art' sibling X seedling #03-12C: ( 'Undercurrent' x 'Parisian Dawn'). Keppel 2013.